Even a cursory glance at Stanley Cup headline news this season will reveal that at least two superstar skaters have continued to compete even though they faced playing while injured. For instance, the Washington Capitals captain, Alex Ovechkin, who appeared to be an underachiever in the series against the Penguins, was suffering from two ailments. A picture of his ailing hamstring muscle, submitted by his wife, featured all the colours of the rainbow. Still recovering from a check by the Leaf’s Nazem Kadri, his knee also required freezing previous to game action to dull the pain. Erik Karlsson, who is the heart and soul of the Ottawa Senators, continues his outstanding performance despite two hairline fractures of his ankle. He too must resort to the numbing process. And, as most fans realize, the “freezing” brings relief while it is in effect—but afterward it is murder. Of course this tactic, which enables players to continue competing when they should be in sick bay, is nothing new in the world’s fastest sport. Equipment in the “good old days” was less protective than modern armour — but the game moved at a slower pace during that era. So, seemingly, it equals out in the long run. But a broken nose is still just as bent and bruised; a rib cage is just as tender—regardless of whether it prevailed in 1936, or curbs a player’s comfort zone in 2017. Playing while hurt — competing under the influence of pain — is a timeless scenario. Examples are numberless. But some have caught the attention of shinny’s inner circle, as well as those looking on from the outside, more than others. Leo Bourgault was hardly a household name in the 1920’s when he skated for the Rangers. The sports writers of that era referred to him as a “chunk of courage”. Though small in stature, his gritty play contributed largely to the Blueshirt’s World Championship in 1928. His nickname was accurate in that he skated and stickhandled despite a broken nose, a damaged shoulder, and a badly lacerated foot. But they couldn’t keep him on the bench. He insisted on truckin’ along until the Montreal Maroons were vanquished and the coveted trophy belonged in New York. Elwin “Doc” Romnes was a Lady Byng Trophy winner in 1936. That was the way he approached the game. That deportment was flawed only once — in a rather excessive manner. On December 20th, his Blackhawks visited Toronto. “Red” Horner welcomed the newcomer to the league by bashing him in the mouth with his stick — breaking his nose in five places. “Doc” promised retaliation in the return match. And, on the 28th, that meeting took place, with Romnes decked out in face protection which made him look like an alien from outer space. But he played. That fact almost outdoes the fact that he made a B-line for the big redhead and nearly decapitated him. Promised fulfilled. The 1932-33 season ended with Toronto holding top spot in the Canadian Division. A seemingly unsurmountable challenge faced them as the post-season action got underway. Their opponents, the Bruins, first-place holders in the American Division bested them only by four points. But the Maple Leafs were poster boys for “the bandage brigade”, with nine of their regulars sporting hurts of one kind or another. Clancy and Thoms had sprained thumbs; Cotton a bruised hand; Primeau was afflicted with blood poisoning; Jackson had a bruised and swollen ankle; Sands sore hip ached; Ken Doraty’s back was out of whack; and Ace Bailey’s collarbone was busted. But somehow they overcame the odds, defeating the Beantowners 3 games to 2. In 1933 the most visible of ailing athletes was “Red” Horner, the league’s bad man with 144 P.I.M. Their series against the Rangers became the subject of a Canadian National Film Board flick. It featured Foster Hewitt entering the dressing rooms and interviewing the players. Front and centre was the rambunctious redhead sporting a big cast, which stretched from his elbow down over his busted right hand. He was asked how he could play under those circumstances. The explanation was that Dr. Rush has designed the cast so he could grip his stick between it and his exposed thumb. Not surprisingly, the blustery Eddie Shore was another of the first NHL’ers to typify the determination of professional pucksters to play in spite of injuries and the subsequent pain. That was but one of the instances where he epitomized the game’s walking wounded—a member of the living dead who didn’t know enough to lie down to cease and desist. That same campaign the heroic antics of another old timer, Chuck “The Wee Scott” Gardiner, came to a sad conclusion. During the 1932-33 season he developed a tonsil infection which drastically sapped his strength. Keeping it to himself, he had no choice but to make it public, when in December he became so sick he would collapse on the dressing room floor between periods. As well, he draped himself over his net when action stopped. With a temperature of over 100° (F) he was rushed to the hospital. In January 1934 his condition worsened, with pain spreading to several parts of his body. He experienced his first uremic convulsion. During the playoffs that year the infection caused him to be plagued with high fevers. A doctor often tended to him during intermissions. The finals, a best-of-five affair, saw the Blackhawks, leading two games to one, face off with the Red Wings in Chicago Stadium. Gardiner, who had been the key to getting that far, became ill again the night before and was taken to hospital. But he insisted on suiting up despite his infection and high temperature. He told his mates to “get one goal”, and he would take care of the rest. After a scoreless draw in regulation time, and thirty minutes of overtime, Mush March salted it away for the Windy City sextet. When the horn sounded Charlie collapsed on the ice. But his heroism was short-lived. Two months later he died in Winnipeg of a brain hemorrhage—he was only 30. One of the strangest revelations of a puckster’s persistence in continuing to compete despite being injured came in a kind of backhanded fashion. In 1937, Chicago’s Paul Thompson stepped into a depleted Windy City lineup because they were shorthanded. He should not have donned skates for that January match, but, despite a badly bruised foot, he was in the game. With this information in mind the Maroon’s Tommy Gorman instructed his players to go easy on the Blackhawk’s winger. 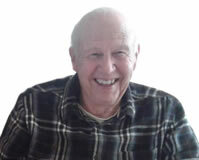 While he was part of the famous “Production Line”, along with Gordie Howe and Ted Lindsay, Sid Abel also helped to make up the “Linament Line” in the early 1940’s. He himself had suffered through a damaged shoulder injury, and was joined with Eddie Wares and Don “Count” Grosso. The latter played most of that year with his wrist in a cast, refusing to let the fact that it was broken put him on the shelf. Three seasons later Gus Mortson, then a rookie with the Maple Leafs, also suffered a broken digit in his foot. However, he prevailed for the full season. It was busted the very first game of the 1945-46 schedule—and he participated in the full complement of 60 games. The Toronto sick bay report included this note about another first-year skater — Howie Meeker. Determined to prove himself (and he did, winning the Calder Trophy), one of his fingers was broken on November first and he never missed a beat. On October 13, 1948, five members of the New York Rangers were returning by car from an exhibition game against Shawinigan Falls, Quebec. During that trip a truck failed to stop at a crossroads forcing a collision with their vehicle. Four of the Blueshirts were knocked cold, and had to be dragged to safety by Tony Leswick. Four of them were not fully recovered by their first match of the season against the Canadiens that very night, and had to sit out. 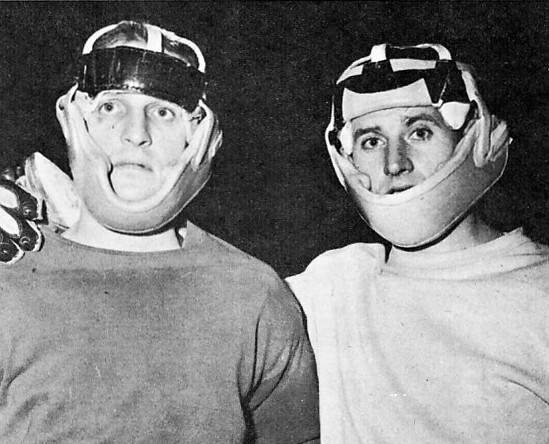 But defenseman Bill Moe, perhaps the least known of them all, played with his heavily bandaged noggin protected by a helmet. Whether it was an era when more dehabilitating hurts were ignored by skaters, or behind-the-scenes information was more readily available or not, the 1950’s world of hockey seemed saturated with incidents of playing hurt. Jack Stewart, the burly defender, first with Detroit and then with Chicago, was called “Black Jack”. It was not because he had a swarthy complexion or that he projected a continuing dark mood. Rather, it was because, on one occasion, a victim of one of his crushing body checks woke up in the locker room and asked if he had been hit by a black jack. But as much as the Pilot Mound, Manitoba, dished it out, he was also susceptible to various hurts. He was referred to as “the game’s most stitched-up player”. As well as a ruptured disc in his back, in October 1951 while playing against the Rangers, he crashed into the boards, and was carted off to the dressing room for stitches. He kept playing, even though later an X-ray revealed he had a slight skull fracture. Headaches continued during his stint with the Blackhawks. There was a time when he had to have boils lanced before he could go on the ice. And on another occasion his wrist was so weak he had to have the stick taped to his hand so he could continue in action. Boils also plagued Montreal’s Dollard St. Laurent during the 1955 post-season. He rested in hospitals, both in Detroit and Montreal during the finals that year, because these carbunckles on his thighs were so painful he could barely walk. He claimed that skating was less painful, so he continued as a walking wounded throughout the series. In a rather unusual scenario, Boston’s Doug Mohns and Bronco Horvath ended up with identical injuries in the same game against the Maple Leafs. It was October 18, 1958. Mohns had already taken a jab in the mouth from Bert Olmstead, when Bob Pulford capped it off with an elbow to the chops. It broke his jaw. Meanwhile, Carl Brewer checked Horvath, with his shoulder coming in contact with the face area — his jaw also broke. Mohns was inactive for 23 games, and Horvath for 25. When they returned to duty they were both equipped with masks intended to protect their tender faces from further injury. These contraptions, which became favourites for photographers, made it difficult for them to see the puck at their feet, and to pinpoint its position on their sticks when they prepared to shoot it. For Bronco it was especially frustrating, in that he was always a threat in the league scoring derby. One of the most dramatic episodes of this kind involved “Red” Kelly in 1960. He continued to play with a broken bone in his foot, tightly taped for each game. The quiet, clean-playing defenseman told Trent Frayne of the Star Weekly that after each game his leg bled when the binding was removed. He said he couldn’t get any “leverage” when pushing with another player battling for puck possession. In the meantime, with the fortunes of the Red Wings waning, every player, including the handicapped Kelly, were fined $100 for not “putting out”. Even though goalies are not normally physically involved in game action in the same way forwards or rearguards are, they are not immune to damages — many of the same nature as their offensive and defensive counterparts. In the December 31, 1961 issue of the Hockey News it was reported that the Maple Leafs’ number two goalie, Don Simmons, had played six games with a broken bone in his hand—six with Rochester of the AHL, and six with Toronto, replacing the injured Johnny Bower. He had stopped a shot with his blocker which did the damage. Blaming himself for not adding padding to the “nearly-worn-out” glove didn’t change anything. Wielding the bulky gauntlet holding the heavy goal stick “hurt like the devil”, he admitted. With him, a left-handed backstop, that meant stopping the majority of shots on his tender paw. The bulk of NHL’ers fire left-handed, with the natural sweep of most of their shots directing the puck to that side of the cage, spelled double trouble for the gutsy Simmons. Some choice he had: stop the shot and bear the pain; or let it sift by and bear the shame. Without a doubt the most publicized instance of playing through pain involved Toronto’s Bobby Baun. In game 6 of the 1964 Cup finals, late in the third frame, he stopped a shot on the ankle, dropping to the ice in excruciating pain. He refused to have it x-rayed, but insisted it be frozen, enabling him to return for overtime. Just short of two minutes in the extra period he blasted a shot past Terry Sawchuk, winning the game for the Leafs. Later examination revealed he had scored the winner while skating with a broken bone in that ankle. Added examples of such grit from those “Original 6” seem endless. Glenn Hall’s mangled mouth being sewn up, with his insistence upon “hurrying it up” (so he could get back in action); “Boom Boom” Geoffrion’s removal of a cast from his injured knee so he could contribute to his team; and the famous photo of Bobby Hull’s smashed nose plugged with cotton while he soldiered on, are just three which readily come to mind. During this entire time frame an undercurrent of criticism prevailed, stemming from a number of old timer’s philosophy about “toughness”. The general impression given was that modern players are “soft” — unlike the years of the vintage game, when real men chewed on iron and spit out nails. In 1941, Tim Daley, the ageless trainer for the Maple Leafs, who was involved in the game as far back as 1910, gave Johnny McCreedy and Wally Stanowski a hard time about “babying themselves” while hurt. But these implications about modern pucksters being sissies are without foundation. Current competitors are just as gritty as those from earlier eras. For instance, in game 6 of the 2010 playoff series between Chicago and San Jose, midway through the second period, Duncan Keith’s teeth fell like Chiclet’s from his mouth—three top ones, and bottom ones — when hit in the mouth by a shot from Patrick Marleau. He went to the locker room, had the pieces picked from his shattered gums, and made his way back to the ice to finish the match. His attitude was, “It’s a long way from my heart!”. He missed only a few shifts, logged 29 minutes in total, and blocked five shots after the mishap. In 2013, Boston’s Patrice Bergeron left game five and was sent to the hospital for observation. But he was back on the ice for game six of the Stanley Cup final against Chicago. He had broken ribs, torn rib cartilage, and a separated shoulder. Later on he was returned to hospital with what was suspected to be a small puncture in his lung. Like Keith he made light of it, saying that in the finals everyone is banged up.